Whispers in the Loggia: "Guide Us, Lord. Amen." As the hometown clamor continues, its fallout threatening repercussions across the wider scene, it's worth noting that this Sunday likewise sees a climactic moment of the Apostolic Visitation to Ireland, mandated by B16 in the wake of the country's torrential revelations of clerical abuse and chancery cover-up. In a liturgy designed "principally" by survivors, the Papal Visitor to Dublin, Boston's Cardinal Séan O'Malley OFM Cap., will join the capital's Archbishop Diarmuid Martin in washing the feet of several members of the community "who have suffered in various ways through abuse." The act of repentance in Dublin's St Mary's Pro-Cathedral will take place in the context of the Services of Repentance which were called for by the Holy See in each of the beloved Isle's four provinces; today's is the last of the group, following December's Visitor-led penance in Tuam cathedral and last month's services in the archdioceses of Armagh and Cashel and Emly. According to an announcement from the Dublin curia, the rite "will ask the forgiveness of God and of all survivors for the failure of those church leaders and many others in the family of the church to respond with love, integrity, honesty, understanding and compassion to the pain and distress of survivors." In some quarters, suffice it to say, this work -- as arduous as it's needed -- is only beginning... or, sadly, has yet to sufficiently begin. Yet wherever we find ourselves in these days, the grace needed to either start along or keep on the path can only ever begin with prayer. In the exercise of your pastoral ministry, you have had to respond in recent years to many heart-rending cases of sexual abuse of minors. These are all the more tragic when the abuser is a cleric. The wounds caused by such acts run deep, and it is an urgent task to rebuild confidence and trust where these have been damaged. In your continuing efforts to deal effectively with this problem, it is important [1.] to establish the truth of what happened in the past, [2.] to take whatever steps are necessary to prevent it from occurring again, [3.] to ensure that the principles of justice are fully respected and, above all, [4.] to bring healing to the victims and to all those affected by these egregious crimes. 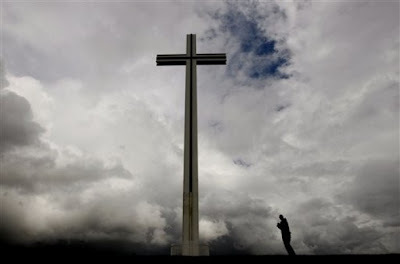 In this way, the Church in Ireland will grow stronger and be ever more capable of giving witness to the redemptive power of the Cross of Christ. I pray that by the grace of the Holy Spirit, this time of purification will enable all God’s people in Ireland to “maintain and perfect in their lives that holiness which they have received from God. The above discourse delivered in the Pope's ad limina address to the Irish bishops on 28 October 2006, these weeks find the Stateside bench is in the midst of its own preparations for what promises to be an intense "checkup" by Rome, almost three years beyond the normal five-yearly timetable. Expected to run through summer 2012, the US visit begins in November's first week with New England's Region I.
SVILUPPO: Martin's reflection from the Dublin penance has been posted.